This secured loan agreement is suitable for any company or human individual to lend to one or more people. (See below for documents for loans to companies). You could use it in a business or private loan situation. If you are the borrower, you have the opportunity to edit any point you would prefer not to include. 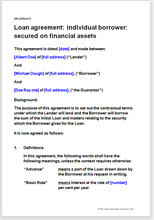 This agreement allows you to use shares or other financial instruments as collateral for a secured loan. The security could be any intellectual property. In addition, we have provided for a third party guarantor. That is optional of course and may be deleted easily. The agreement could be whatever you want to put in it, but we have provided a sound and comprehensive set of terms, many with options. It is supported by drafting notes so that you will know whether you can safely delete some provision. It is most unlikely that you will want to add new provisions, but if you do, it is easy. Our layout and use of plain English also make it very easy to edit by deletion. "Net Lawman provides a simple and low cost method for access to legal documents."